Named after the humble rice grain, Palay Restaurant celebrates freshness and simplicity, two of the most overlooked secrets behind every great dish, be it Filipino or international. A beach restaurant like no other, Palay is a perfect venue for private dinners and family celebrations, corporate events and wedding receptions. Dine in style with a fabulous seaside view and sumptuous world-class cuisine. We have on board our own chef known for his superb beach cuisine. Sample our world-famous beach cuisine. Our kitchen can handle small, intimate private dinners and all the way up to large functions and celebrations. 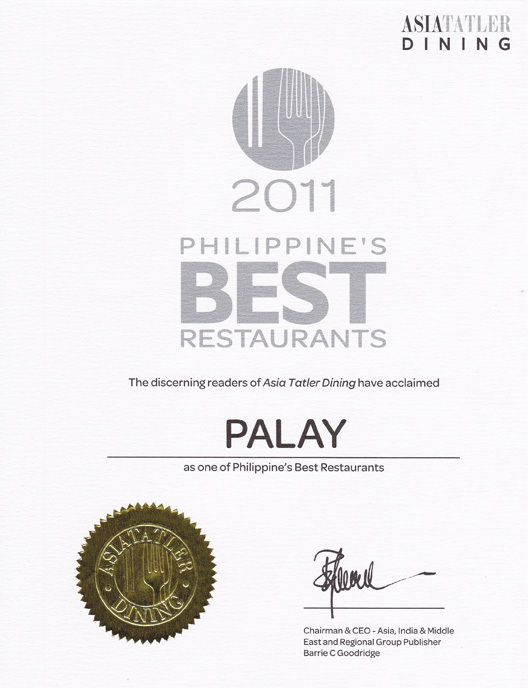 Palay is a multi-awarded restaurant, here featured is our most recent citation.